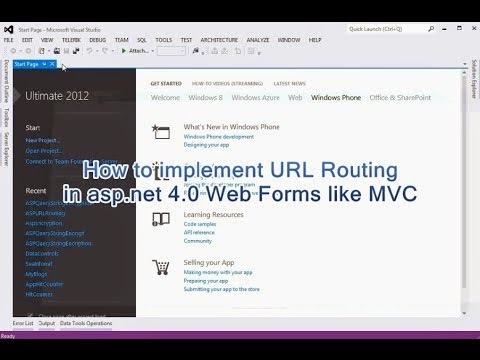 In this post, I explain how to implement URL Routing in asp.net 4.0 Web Forms like MVC. One of the best new features of ASP.NET WebForms 4.0 is URL Routing. Using this features we can transform complex URLs into simple, search engine friendly, easily understood by users and consistent Web addresses. We can do this by following this below steps. Step-2: Write code for URL Routing in Global.asax.cs page. Write the followings code in Application_Start event of Global.asax.cs page. Modify Menu Link in site.master page. Step-4: Create a table and insert data. Step-6: Create page for show list of product. Go to Solution Explorer > Right Click on Project under solution explorer > Add > New item > Select Web Form under Web > Enter Name > Add. Write the followings code in your page load event for fetch Data from Database. Step-7: Create page for show product details. This is for getting Query String value.